Yes, I confess that I have never visited any of the Tate galleries before, but today Sharon, Mum, Irene and myself went and visited the Tate Britain on Millbank in London. The galleries are arranged in decades which gives an interesting perspective on contempory artworks through the ages. 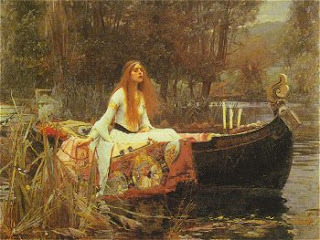 I now realise how much I like the Pre-Raphaelite style paintings such as the Lady of Shalott! A word of warning - don't have the Gooseberry, Elderflower and Lemon smoothie in the cafe, it's far too sharp!